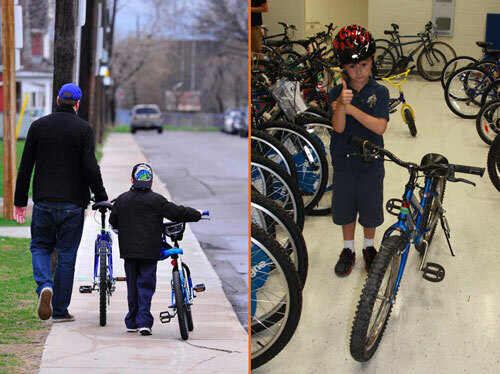 At Bike for Mike, our aspiration is that 100% of students who are able will walk and/or ride to and from school. In partnership with the Hamilton Wentworth District School Board and the Hamilton-Wentworth Catholic School Board, Mike Bikes is a thoughtful, comprehensive program to eliminate the barriers that prevent a student from safely riding to and from school. When owning a bike is a barrier, we do this by providing bikes, helmets, bells, and locks to children across Hamilton where they have an opportunity to earn a bike by riding regularly to an from school. Also, either directly or with partners, we ensure each child learns bike safety and maintenance, while helping to foster pride of ownership and regular bike usage. Since our inception in 2011, we have provided over 2,300 bikes for children and families in Hamilton and plan to encourage an additional 1,000 new riders per year. Or make a donation to the Michael Chamberlain Fund at Hamilton Community Foundation. ©2019 Bike for Mike. All Rights Reserved.